The design system is available to protect a design of an article under the design rights. Please click the Design System for details. article shall not be used as a registration object. those articles relating to the registered design or similar design. 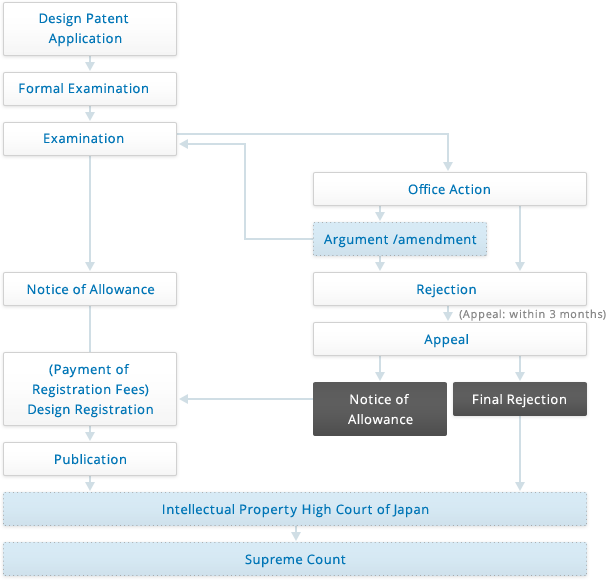 Design registration shall mean that an application is filed at the Japan Patent Office in a specified form, so that the design patent can be granted after examination. The application for a design filed in Japan is subject to examination by the Japan Patent Office. The design system also imposes some requirements for novelty and creation difficulty, etc., and follows the first-to-file principle. Therefore, you are strongly recommended to file a design patent application after the design is done and before the commodities are introduced or disclosed to the markets. The formalities for the design from its application to its granting shall be professionally operated, and sometimes, the formalities cannot be changed, so you are kindly requested to delegate the professional Tsubame Patent Attorney Firm for application. Our Firm can handle the design patent applications filed through the Paris Convention and the Features of this course design patent applications filed directly with the Japan Patent Office. We can also reply to a refusal notice for international applications filed under the Hague International Registration System, etc. As for the design cases, the attorney fees during the application period are between JPY 110,000 and JPY 150,000. In addition, the official fees for the Japan Patent Office shall be charged. Please consult with our firm for details. ※ The fees for the design patent application include the consulting fees, prior simple search fees, application preparation fees, and the fees for filing the application. The fees for answering the Office Action(s) and registration (including the success remuneration) will be otherwise charged. ※ Our firm can provide separate search services (min. JPY 15,000). After answering your inquiries, our firm will send the Letter of Authorization to clients. The clients shall provide the design drawings and specifications on products. If the design patent application documents are in place, please inform the contents thereof. As requested by the clients, a prior design search may be conducted. If there are identical or similar registered designs, the application may be rejected. So, if any similar registered designs are found, our firm will provide a new application solution to avoid being recognized as a similar design. ※ The basic design patent application procedure includes the simple search services. Our firm will prepare the Design Patent Application according to the design patent search results. After that, our firm will confirm the same with the clients, and if needed, our firm will make modifications. It is noted that when the design patent application is filed through the Paris Convention, the substantially exact representation is subject to rigid judgment, and the color of the design cannot be changed. The design patent application confirmed with the clients will be filed with the Japan Patent Office online. After that, an official filing receipt will be sent to the clients. The Japanese application number will be issued by the Japan Patent Office immediately. After the design patent application is filed with the Japan Patent Office, the application will be subject to examination by an examiner of the Japan Patent Office, in respect of its identity or similarity to the registered design, or its creation difficulty, etc., in order to judge whether it can be registered. After 2-6 months since the application is filed, the Japan Patent Office will issue the Notice of Allowance or Office Action. If the Office Actions are issued, our firm can provide professional reply services (including preparation of the amendment / argument) for you. The argument shall describe the reasons for its dissimilarity to the registered design or its creation difficulties, in order to be registered. Moreover, even if a Final Rejection is received during the examination period, an Appeal may be filed, in order to a obtain design right during the trial period. ※ The fees for reply during the examination period include: the fees for the statement of opinions (min. JPY 60,000) and the fees for the amendment (min. JPY 60,000). Please consult with us for details. After the Notice of Allowance is received from the Japan Patent Office, it is required to proceed with the registration before the Japan Patent Office, and pay at least one-year registration fees. After the design patent is granted, in principle, it will be published in a Design Publication. But there is an exception that the patentee expects to keep it confidential within a certain period. The exceptional system where the design registration is not published within three years from the registration date is called ‘the design confidentiality system’. The term of the design patent protection shall be 20 years from the registration date. 1.A design patent right refers to a distinct right of implementation with respect to a granted design patent and a similar design. It enjoys the exclusive right of manufacturing and sales with respect to a product related to the design. Where a third party makes unauthorized use of a granted design patent, an injunction is applicable and even compensation for damages can be claimed. 2.The design patent Right exists independently in all countries. Therefore, if the grant of a design patent is required overseas, it is necessary to submit a design application to each country respectively. Refer to Overseas Application for details. 3.A design requires certain degree of difficulty. Any work that is the same as or similar to an existing design or a design publicized through press networks and the like, and that can be readily created through a recognized design (which is not limited to the design in the intellectual property only), shall not be granted a design patent. 4.The protection duration of a design patent is 20 years from the registration date. The duration is considerably long in Japan since the protection duration of the design patent is calculated from the registration date. Moreover, the term related to an affiliated design patent right is the same as that of a dominant design patent. 5.Designs such as computer screens and operation panel designs are also subject to the protection of the design patent right. For any operation necessary for exerting the function of an article per se, the design of such operation interface (picture) shall be also protected by the design patent, for example, designs such as paper size, magnification and print count of a printer. If there is an association among the switched screens by operating a portion in a screen, the plurality of screens can also be registered as one design application. 【Description of design related article】（in brief）the enlarged view of the display and the enlarged view of the changed display are used for identifying an adjustment to volume. By sliding a volume adjusting dial, the display on an instrument changes to show the current volume. 【Description of design related article】（in brief）this article is a digital camera which is capable of sensing an inclination angle of a camera and is provided with gradienter. The image shown in the front view is a gradienter icon for keeping a level condition during photography. 6.The design of a series of articles is the design of a set of products. The design of a set of products refers to a system where a series or set with a plurality of incorporated articles is considered to be uniform and thus is protected as one design patent right. For instance, all the members (such as tableware) have the same shape or design and can be combined to present a visible shape or look (for example combination sofa). This protection system may be directly targeted at a design imitation behavior where partial articles are different but can be combined into the same or similar article, thereby possibly providing better protection to the rights of a design owner.